Haiku Theory Archives / INDEX is HERE ! but thus, it is the basics of Japanese HAIKU. It is very different from the concept of Poetry we have in the West (living in both cultures, I had to learn the hard way). No unnecessary decoration, no special vocabulary, no forced juxtaposition, no poetic circumlocation, no heavyhanded philosopical implications. Just three simple lines, telling us what happened there, right now ... and then some, of course! Let nature speak through you in her own language, do not impose yourself on nature with your poetic words. If you shoot from your own center (hara), you will hit the target in the center! ... and then jump in the pond of haiku ! For me, it is well worth the effort ! Gabi san, you have showed me the spirit of Haiku. This is just a simple observation, or not? To get to the Japanese meaning of this one, .. click HERE ! "Do not fill up the whole picture with lines; also apply colors with a light touch. Some imperfection in design is desirable. You should not fill in more than one third of the background. Just as you would if you were writing poetry, take care to hold something back. The viewer, too, must bring something into it. If one includes some empty space along with an image, then the mind will fill it in." MA is a most important something in Japanese art, and even in Japanese daily life, even nowadays. I once knew a foreighner, who could speak the language perfectly BUT could not insert the necessary MA when it is time to pause and give your partner a time to nodd and make his aizuchi, hmmm, aaaa remarks. Thus each of his dialogs was spoiled soon and ended in a monolog. Did I do my best? Or can I do a bit better? If this was my last haiku to write in this world, would I be proud to leave it as my legacy? Can any reader, who has not experienced this situation with me, understand what I want to convey? Did I get the meaning right and expressed what I wanted to say clear enough? Is it not toooo cryptic and ambiguous to be understood properly? (In case it is tooo cryptic, keep it in your private haiku diary for a later re-write.) My German way of thinking had to be re-programmed quite often. but write in a way that any reader will understand what you are trying to say. Will the reader say WHOW? or rather SO WHAT? After all, you thought it worth to be a haiku and wrote it carefully in an understandable way. You know, the tastes of readers are manifold. Some like cats and others like dogs. It is like the pebbles on a beach, some pick up this one and some another one. I often get varying comments, one saying, what a dumb haiku, the next saying: How great a haiku! I want to write a haiku to be published in "XYZ Haiku Magazin" or a haiku to win the XYZ contest! Quietening the heart, ridding yourself of anxiety, casting out categories of what pleases and displeases, of likes and dislikes, and not thinking in categories of "what is valuable" .. These judgements cling to the very depth of your heart and prevent you from a full life experience. Haiku is a poetry not of the mind or invention, but of experience. When the subject of a haiku involves a major human emotion such as love, it is the writer’s challenge not to overwhelm the poem. Haiku writing is a way of seeing the world and expressing an insight in a manner as unadorned by the poet’s opinion as possible. Death, grief, and love are certainly parts of life and as such are subjects for haiku. But what is love? The ancient Greeks used three words for love: eros, agape, and philia. Eros as love should be obvious. Agape was used by early Christians more specifically than “altruism” alone. The word came to mean love of God, or God’s love. In addition to “brotherly” love, Aristotle described philia as showing love by a parent. It is this most basic perhaps original bond among humans that Billie Wilson has indicated to the reader. Japanese haiku poets are usually a member of a local haiku club, they are proud of their sensei and write in the tradition of this school, with respect to the Asian poetry culture ... all the way back to China. In a non-Japanese environment the position of haiku seems different. It falls into a vacuum, since the general categories of Western poetry and lyric did not provide for such a short form. Most haiku poets do not have a personal teacher and use online workshops, where anyone can post an opinion ... and the poor poet has to decide which is qualified and which is not! Since short is easy, anyone can write three lines of something, declare it HAIKU and here we are ... ! It suits the Western idea of individualism very well. Sometimes I feel poets are parading their haiku dog, telling everyone "This is my cat." If you have never seen a real cat (appreciated haiku in the Japanese language), you might tend to believe him / her. Cross-cultural take-over comes at a prize. it is becoming more and more popular these days, now with facebook here to facilitate "socializing". For a successful HAIKU workshop, the administrator should first and foremost state his/her definition of the genre, otherwise it is just another outlet for short poems of "anything goes". There must also be a consideration for people who use English as a second or third language and are not native speakers (like myself, first language is German). first to improve on the mistaken English, vocabulary, grammar etc. second improve on the haiku image. Step out of your own shoes and haiku agenda. Step into the shoes of the author. What does he want to convey? What did he experience and is now trying to put into words? As an editor of a haiku journal you are entitled to accept only poems that fit your own agenda to promote the magazine. As a mentor in a workshop, you should forget about this (otherwise you would be promoting tentori). You should help the author to improve on his conditions, not on yours.
. Polishing a haiku after writing it down . To be added as we go ! My experience in the translation business goes back more than 40 years, working as a medical doctor/translator in research programs for the WHO, University of Heidelberg. texts about Japanese Buddhist Art. I am born German and live in Japan since 1977. I work as professional translator for scientific and HiTech texts and do cultural translations for my pleasure. I do not consider myself a poet and translating haiku is rather new to me. Since neither Japanese nor English is my mother tongue, it is indeed quite difficult for me to find the right words. I will nevertheless try to assist as best as I can to help you understand Japanese Haiku. Apart from the pure language problems, there is a lot about the culture that you might not know and I can provide "footnotes" for this kind of missing knowledge, I hope.
. Japanese Haiku - Translations . let us just try to understand the original and present it to the readers who do not speak Japanese (or any other original language for that matter) as best as we can, to give all a chance to understand it better, in its original form and contents. Considering the old haiku of Japan, we even have to make a time-slip to their use of the language and the culture at that time. Studying a haiku at the forum includes literal translations and then other versions that might be possible. Some might read better as poems, others not. In that way we can show how a short Japanese poem is indeed not so easily transformed into another language. As I mentioned, we also need cultural background information. Knowing a haiku is about Manpuku-Ji we need to explain a bit about this important temple and its atmosphere. "Autumn festival" is a simple translation of AKIMATSURI, but it will not tell you what really happens then and how the Japanese associate and feel about it. So you need more cultural background. I admire Robin Gill for giving his thoughts and versions while translating a haiku. In studying a translation by someone else, let us see what other kinds of versions we can come up with. Not as a competition for "Best Version", but for bringing out the broadest meaning of a haiku to more of the haiku friends who do not read Japanese and who are here to study. but not japanese your Polish ?! I was told so many years ago by a Polish Jesuit priest at the Japanese Language Center in Kamakura. Many of you are tempted to write their own haiku in Japanese! I can understand the feeling, but please, take my advise. First learn the normal Japanese language as it is spoken in Japan (many books teach you "literal" Japanese, which no one speaks). Once you consider yourself fluent in normal Japanese conversation, start reading about haiku and get your big Japanese saijiki. Learn the vocabulary needed there, get some knowledge abuot the grammar used in haiku. There are plenty of cheap books in Japan. And then, try to find a Japanese teacher who will kick your shin if you make a mistake. Do not go for the "backpatting" pet gaijin approach, that will not help you improve your language skills. And please, please, please, do NOT use Babbelfish or other online translation services. They may be useful for normal text, but never for poetry ! Writing your own haiku in Japanese only works if you are serious to invest about 5 years of intensive language learning (best spent in Japan) and then the rest of your life for improvements. So better not start at all and spend your time more efficiently to improve your skills for writing good haiku in English (or whatever your mothertongue is). When translating, it is not only about words, but of a cultural understanding that might not (and usually does not) exist in the target language. I will always remember the first missionaries looking at what we now call "Buddha Statues". They only saw hineous fiendish demonic fetishes (Götzenbilder in German) and translated the literature accordingly. 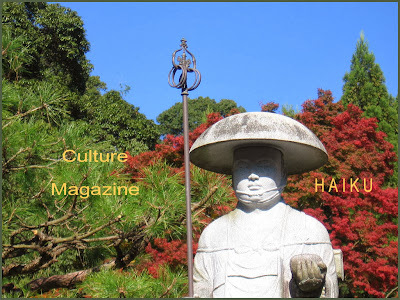 When I started writing about "Buddha Statues" in German, more than 30 years ago, I had to sort of make up my own vocabulary to convey what these things mean here in Japan in their original context and in the daily life of the Japanese. Usually you look into things from the standpoint of your own culture, trying to understand it on YOUR terms, using words of YOUR language. I am beginning to believe... truly believe, that haiku can only be written in Japanese because it is intrinsically Japaense. I look at it this way. If you are to construct a sake cup made from Japanese wood, of Japanese design, in a Japanese setting filled with sake made in Japan... then how can you do so in another wood, design, setting or drink? By definition, you just can not. I think place names should be used as they are in the original language. If necessary, an explanation about the meaning of the name can be given in a footnote. This is a river called Arakawa. (To not translate: river Ara, or even worse, river Wild. 東京, this is Tokyo, meaning the "Eastern Capital". 不二, this is Mount Fuji, in the old writing of Issa, Meaning Mount "Not Two". Here is a haiku with a play on words on the "stone mountain". Read the full discussion HERE ! When a Japanese person hears "Ishiyama," do they just hear a name, or do they hear the underlying meaning of that name? I am tempted to suggest they just hear a name, in the same way that English people most likely just hear "Cambridge," and "Oxford," without thinking "Cam-bridge" (a place where there was a bridge over the River Cam), and "Ox-ford," (a place where oxen could ford a river). So if "Ishiyama" is used in a translation 'as is', I would think it should be footnoted as to its meaning. And if one decides to do that, why not just use the name's meaning in the haiku, and make "Ishiyama" a footnote to that? I'm also curious about Mt. Asama. Does "Asama" mean something in Japanese? 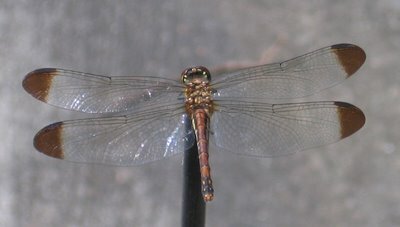 Haiku has those two elements,i.e Kanji and hiragana, image and music. Asama 浅間 is old style Japanese that comes from Ainu. It sounds softly, romantic, analog and emotional. Sengen is Kanji itself that is image, reasonable, digital and theoretical. Famous Places, best with a word of information. The Hepburn Romaji spelling and the spelling used more or less oficcially now can be different. I usually try to reflect both. General problems concerning our haiku translations will be collected here, as they come up. Spelling Japanese : Please use the Hepburn System. Tools of the Trade, check our various LINKS here. Add your favorite language tool LINKS. In the introduction, Barnhill mentions some of the problems involved in translating haiku. The way Gill translates is not only marvelous, it is absolutely revolutionary. Instead of giving the reader the idea that there is only one way to translate a haiku, he offers a word-for-word translation and then goes into great detail explaining the ambiguities of the Japanese language along with the secrets of Japanese behavior. His final translation is often a series of possible ways of putting the haiku into English. . . . He is even secure enough to admit when he really cannot figure out what the author was trying to say. . . .
Can the Spirit of Haiku be Translated ? What can I say on translating haiku? Obscurity is not something to be emulated, and we should be careful to avoid it in modern hokku. The issue of translation arises, however, whenever one reads an old hokku put into English. The average reader does not know, first of all, if the original was clear or vague, or whether the English translation simply transfers the meaning from language to language, or if the translator has added considerably from his or her own imagination. ... reading a word-for-word translation does not mean one is getting the same effect as reading it in the original language. "the language of haiku ... is based on colloquialism, and in my opinion, the closest approximation of natural conversational rhythm can be achieved in English by a four-line stanza rather than a constrained theree-line stanza.... "
"this translation is primarily intended for lovers of poetry, and only secondarily for scholars whose minds should be broad enough to recognise the use in a translation like this. It's not for those purists who insist (without believing either in its validity or possibility, I presume) that haiku should be translated with the original seventeen syllable scheme or at least into three lines." Personal pronouns are often implied in the Japanese language, but should be translated in other languages when things are not quite clear. It usually does not add additional depth to a poem, but a bit of confusion which is better avoided.
. aimai 曖昧 ambiguous, unclear or vague . . . . . Haiku Riddles . . . .
As a translator, sometimes you have to make up words as you begin to understand things deeper. Or experiment with spellings to convey the meaning of the CUT, kireji etc. The katakana spelling of ハイク (in my re-translation: HA.I.KU) indicates this is a foreign word not common in traditional Japanese language. MANY More LINKS about 俳句　英語 ハイク!! is a property of a text, or of any utterance, in one language, for which no equivalent text or utterance can be found in another language. Terms are neither exclusively translatable nor exclusively untranslatable; rather, the degree of difficulty of translation depends on their nature, as well as the translator's abilities. Quite often, a text or utterance that is considered to be "untranslatable" is actually a lacuna, or lexical gap. That is to say that there is no one-to-one equivalence between the word, expression or turn of phrase in the source language and another word, expression or turn of phrase in the target language. A translator, however, can resort to a number of translation procedures to compensate. Add your favorite translation LINKS as a comment here. Poetry is language skating on thin ice. Translators fish through a hole in the ice. the Language of Japanese Poetry." The discussion on the "cut" has been very interesting and shows another example of "doing your research". The poem "snicked" into place once I realized the meaning of the folding mat and its uses. This is what I mean about Japanese HAIKU. I have always found it exciting, frustrating, informing, exhausting, etc...(in short a "joyfull struggle") to attempt the translation on my own especially with tools like google combined with membership in groups like this group. I feel very blessed to know people with such deep interest in Japanese HAIKU. Thanks. One of the things I enjoy about being in a group like this, is that it gets me to re-reading things I haven't read in a while,and it is an impetus to study haiku. If I could read Japanese fluently, I would follow in Shiki's footsteps, and study, study, study Japanese haiku, both classic and contemporary. Such study couldn't help but improve one's own haiku (if one can get beyond "the anxiety of influence," to use the critic Harold Bloom's phrase). Back to the Discussion Forum !!!!! Learning a language is one thing, but being a (professional) translator is quite something else. Everyone can use watercolors and paint a little enchanted something, but to be a proper painter it takes a bit more ! Translate only into your mother tongue! Google or consult your dictionary for all the words before attempting a translation. My advise is to insert BUBUBU for any word that is left in your language. This will enable you to understand your translation as anyone else will understand it who is not able to speak your language. Now you have two options. Maybe more. Leave your translation as it is and provide footnotes for the BUBUBU words. The more extensive the better. Look for translations for the BUBUBU words. With the computer age and GOOGLE, it is quite easy to find out if the word is commonly understood in English or not. LINKs to Online Dictionaries. Add yours. Since haiku are soooo short, a lengthy translation inlcuding the meaning might spoil all the meter of your poem. If an appropriate short translation is not available, maybe the footnote will be the final solution. In cross-cultural context such as haiku translations, I guess we will need a lot of footnotes and tools like the KIGO database, to get as close as we can to the real meaning and associations hinted at in the original. dhyaana ~ Dhyaana is now an English word which means roughly meditation. I'm not a translator, but I've read about the problems inherent in translating poetry from one language to another. I think that one quality a good translation has is to sound good in the target language. That's why some very good translations have been made by poets in the target language who have no working knowledge of the source language. Good poets have a tendency to know what sounds good in their language. I think that in many cases, literalness needs to be sacrificed in favor of giving the 'spirit' or 'intent' of the original. Since cranes walk in a stately, graceful, solemn way, (as has been noted in other languages, ie. Dylan Thomas' "heron-priested shore"), you need to fill-in what a Japanese person would 'expect' (sasuga). An explanation of the cultural background of a poem should be footnoted more than it frequently is in many translations of poetry in general. In the old Japanese calendar, New Year's Day and the official first day of spring come at the same time of year, but don't always coincide. Sometimes the official first day of spring came before New Year's Day. I believe Basho and Issa even wrote haiku about this phenomenon. The New Year is usually treated as a separate haiku topic from spring, so I would be careful about using the New Year and spring interchangeably in translation. In "The Essential Haiku" by Robert Hass, he includes "A Note on Translation" which is worth reading. In "Section V" (subsection 9) of Blyth's first volume of "Haiku," he writes about translation. Although I've only read some online material by Robin Gill, his books on translating haiku come highly recommended. First Spring (hatsu haru) and more kigo of the New Year season. Some of my musings about translating this line ! I especially recomend the book by Toshiharu Oseko　尾迫利治　for translators. There are no greater clichés among haiku circles than quoting Basho's frog haiku. 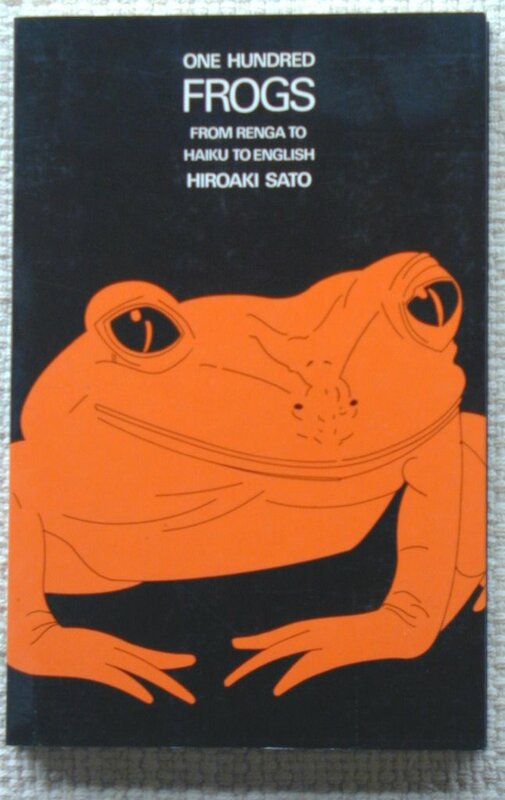 Basho's frog haiku is almost definitely the most famous haiku ever composed on this planet. 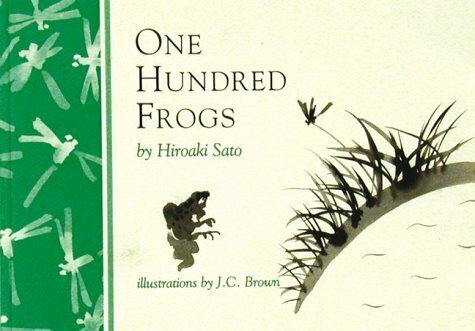 A quick note to clarify what seems to be a bit of confusion regarding Hiroaki Sato's "One Hundred Frogs." David McMurray and Jane Reichhold are actually referring to TWO different books with the *same* title by the *same* author, both published by the *same* publisher. 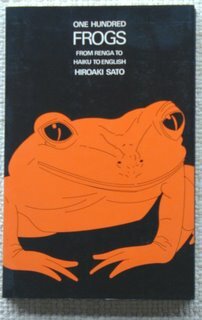 Sato's original book is titled "One Hundred Frogs: From Renga to Haiku to English" (Weatherhill, 1983). This book is 242 pages long, and contains a history of renga and haiku in Japan and in the English language. Chapter 7 contains one hundred (+) translations of Basho's famous "old pond" haiku. It is *this* chapter that McMurray has seen published as a separate new book. That second book is called "One Hundred Frogs" (Weatherhill, 1995 -- note *no* subtitle). This book culls all the "old pond" translations from the 1993 book, plus adds a few more (I think there are 130+ now), with no other essays except the introduction. This more recent book is also smaller in dimension, yet it is improved by wonderful illustrations by J. C. Brown -- and if you "flip" the pages, you'll see the drawings of a frog jumping into a pond become animated! (Yup, it's a flip book too, although you have to figure that out on your own...). The following is part of a discussion from the Simply Haiku Forum in April 2006. I like the lyricism in this haiku (it's metre). In writing haiku it is important to remember that we are writing a poem and poems are more than a conglomerate of words, a a snapshot of something..... there needs to be that poetic something, that "umph", as demonstrated by this beautifully written haiku. by the way, do you know the Japanese original of this haiku? "...a hint of wind ON a night of snow" .... normally it would be IN, but the poet didn't use IN ... and I think, and I am only conjecturing here, that it's due to the imagery the poet is painting.... inside the flame in the poet's lamp is a HINT OF WIND layered so to speak, "on top of a night of snow." PS... Robert san, I am sorry, but, I did not understand your explanation. Could you give us a chance to learn the original? Not that one you gave us, about sweeping and fallen leaves by Taigi, but that one with a lamp, wind and snow. How can we speak about nuanses used by the poet, if we can see only the translation? As I know Japanese haiku, I am 99% sure, there is neither "on a night of snow" nor "in a night of snow", but just "yoru no yuki" == "snowy night" = "night of snow". Anything additional is added by the translator, to make the translation a poem in English. ON ---> the poet is a painter ? IN ---> the poet is a sculptor ? Nonsense, it is nothing to do with the poet. The last line means just "snowy night" and it depends on the translator how it will be written in English. Reading the original I can see this haiku quite different than the translator and you. damages in the reader's mind. The most of Japanese lamps are not transparent, so one can see neither the shape of the flame inside nor its moves caused by the wind. for them who accepts haiku looking like one sentence. After L2 I don't know how it is possible, but after L3 and after 3 marvellous seconds ;-) I know everything. Inochi wa fuuzen no tomoshibi. Life is a lamp-flame before the wind. the meaning of * tomoshibi * is really very deep in the Japanese language. It could be the small flame of a rapeseed oil lamp too. If the poet is inside his home, why would his flame move in the wind? Well, looking at this Japanese, I must say, the translator has added quite a few meanings of his own ... as I thought when reading the English first. yoru no yuki, as Grzegorz pointed out, simply is snowy night, night of snow, snow in the night or something simple. by introducing ON in the translation, it looks like one sentence spread in three lines, but in the Japanese, we have a cut (kire) after the ARI in line 2, which is not expressed in the translation below. You can see the wind both viewing falling snowflakes (the wind outside the house) and observing the moves of the flame (the wind inside the house). "Tomoshibi" in my Japanese-Russian ;-) dictionary means just "light" of a lamp or smth. like this. That is why I always suggest to put the translation together with the oryginal. Translation is just a help. of course without strong suggestion, that a wind is inside the flame, but it just exists, blows tonight. The wind is not inside the flame or lamp, it is only making itself known trough the flickering of the flame, that is all. I can sense the snow falling gently, this is not a stormy night. I think together with such kind of translation, there should be a note added, that Japanese like to observe snow falling, blooming trees, etc., and they open their doors to do it, even at night. The translator is one of the world's leading translators, Professor Steven D. Carter of Stanford University. I suggest you take this up with. And good luck! His experience is translating is extensive, he speaks fluent Japanese and archaic Japanese, and has an extensive understanding of the culture and linguistics. Translating isn't as easy as some may think. I have interviewed Professor Carter. He is an amazing scholar and the author of several highly respected books of translations and discourses. I suggest you become familiar with the translator before you take him to task. > I do not know anybody, who thinks it's easy. > "Impossible" is a better word, I think, but it is possible to know which words are used by the poet, and which are added by the translator. > Talking about the poet, let us talk about the author, not about the translator. > Look at the raw translation by Gabi. > The translation by Carter strongly suggesting the wind inside the flame is only a little part of wide meaning of L2 in Gabi's version. > Carter's translation without romaji version is completely useful for me, if I want to translate this into Polish, because it seems to be improper in my sense of haiku. > And Gabi's version is a base for a good translation if someone doesn't like such raw versions. > My request is still actuall - presenting translations add romaji version. Or just say it clearly - let's talk not about the haiku by Ryota, but about haiku by Carter written after reading haiku by Ryota. > Then I will say no word, because I'm not interested. See my article about Kumarajiva, the famous Translator . If you have a problem with translating Japanese haiku, feel free to contact me. Haiku are short, only three lines as a general rule, so we should not pack too many differing ideas or themes in one haiku. The first short idea could well be the kigo for this haiku. Each haiku has only two ideas or themes now and reads very smoothely. If you have three lines with three different ideas, they usually read quite staccato and not like a smooth haiku (I do not like the expression "in one breath" very much ...) but haiku should read like the gentle flow of a nice brook on a soft spring day. Mumbling a haiku to yourself aloud and listening to the flow is one important part when composing haiku. Make it your habit to mumble to yourself! If it does not feel like a gentle flow, keep searching for better words. This was one of the first pieces of advise from my Japansese sensei. If your original haiku has three separate ideas, search for the two ones you really want to write about and expand one of these ideas over two lines. Here is one of my recent examples with the short idea in line three. January is the kigo, kept in the short third line. The hypen - is used to indicate the break (kire in Japanese) between the two ideas. Use simple and precise words, poetical or philosophical embellishment and contrived phrases are not suitable for haiku. State what made you pause at that moment when you conceived your haiku in plain words, like a snapshot with a camera. THEORY : Why 5-7-5 ? Or rather, Why Not!